Kamar Baldwin dribbles the ball up the floor. Baldwin posted 12 points, three rebounds and four assists. Photo by Jimmy Lafakis. The Butler men’s basketball team got back in the win column with a 70-55 win at home over Brown. Butler never trailed in the game and led for over 38 minutes. Here are three takeaways from a decisive victory. 1. Butler’s defense is for real. Eight games into the season, only one team has scored more than 70 points against the Bulldogs. Brown made a single field goal in the opening 8 minutes and 45 seconds, which contributed to a 1-for-16 stretch for the Bears. They only managed 17 points in the first half and shot 36 percent for the game. Butler shut down the paint and 3-point line, the two most important areas of the floor. Brown went 4-of-23 from deep while registering only four points in the paint during the opening 20 minutes. Regardless of the opponent or how well the Bulldogs are shooting the ball, they’ve been incredibly consistent defensively. For a team still trying to figure things out on offense, guarding at a high level is vital to keeping games close. As long as Butler’s defense doesn’t suffer as the offense continues to improve, it has a legitimate chance to win every time it takes the floor. In early December, it’s unreasonable to expect any team to be polished on both ends of the floor, so looking this good on one of them is absolutely a reason for optimism. 2. Kamar Baldwin managed to forget about Saint Louis. Following what was easily his worst game in a Butler uniform, Baldwin dropped 12 points on 42 percent shooting. He also dished out four assists and only turned the ball over once. Baldwin’s performance was not special by any means, but he showed no ill effects of what happened against the Billikens. He struck a nice balance between getting involved offensively and not forcing anything in a game where other Bulldogs, namely Paul Jorgensen and Henry Baddley — a combined 5-of-11 from three — had good shooting nights. Baldwin looked like himself, which is crucial considering how important he is to this team and the upcoming Crossroads Classic against Indiana on Dec. 15. The Bulldogs can’t afford to have a rough outing from their best player turn into a stretch of bad games. Baldwin’s ability to move on instead of dwelling on the past is incredibly encouraging and a credit to his mental fortitude. While he connected on only two of his seven 3-point attempts, he played with confidence and made three of the five shots he took inside the arc. 3. 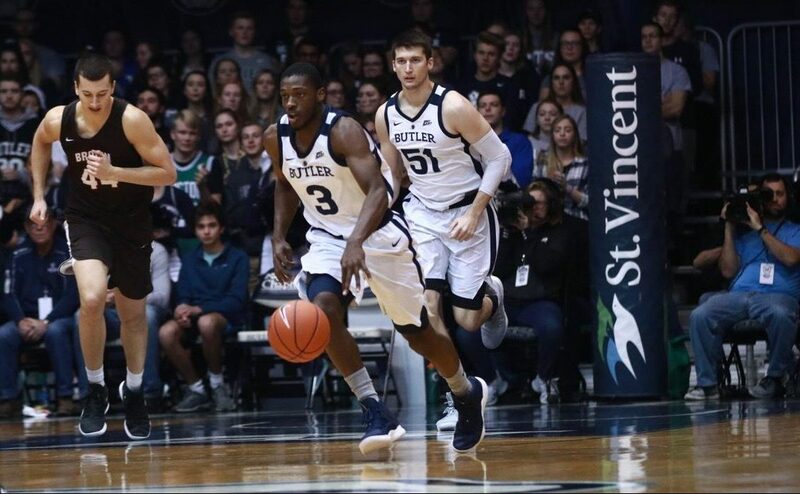 Butler continues to take care of business inside Hinkle Fieldhouse. The win over Brown extended Butler’s nonconference home winning streak to 47, the third-longest in the country behind Arizona and Duke. While a legitimate argument can be made the Bulldogs should have won every one of those games, college basketball simply doesn’t work that way. Going unbeaten at home during nonconference play for six straight seasons, with an excellent chance to make it seven, is a remarkable accomplishment. Avoiding bad losses, especially at home, helps a team’s NCAA Tournament resume as much as solid road wins do. The Bulldogs’ ability to go unblemished season after season is a major reason why they’ve made the Big Dance four years in a row. Butler can afford to lose a couple road and neutral court games early on, just like what happened this season, and still be in good shape come Big East play because of how dominant it is in Hinkle. Obviously, no win is guaranteed at this level, but the Bulldogs have made their nonconference games at home about as close as it can get.